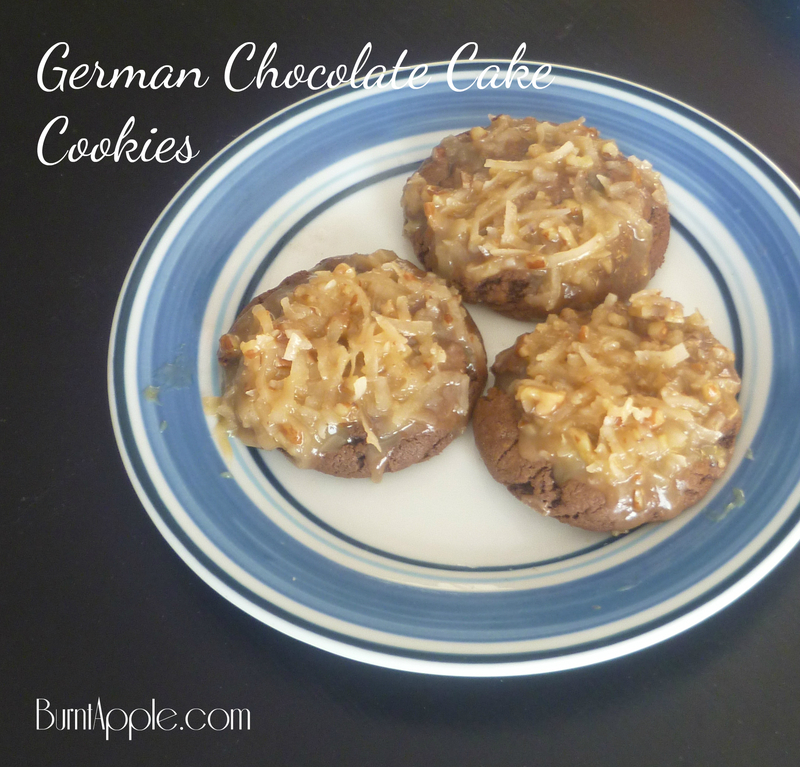 I need a whole box of these German chocolate cookies. It’s been a rough week, and I am craving German chocolate cake. Since I am too lazy to make a German chocolate cake right now, I guess that German chocolate cookies will have to do the trick. I first want to thank fall soccer for giving me this nasty cold after a freezing cold game the other night. Because of you dear fall soccer that wall of mosquitoes that came rushing in the other night from off the field will now (in addition to my cold) give me West Nile Virus. I get sarcastic when I’m sick. It’s also been a rough few days. Our favorite family laborador companion, Sadie and I spent over two hours in the vets office on Friday. They found a mass that’s pushing on her trachea and esophagus. She hasn’t been able to keep anything down and has been coughing for the past month. 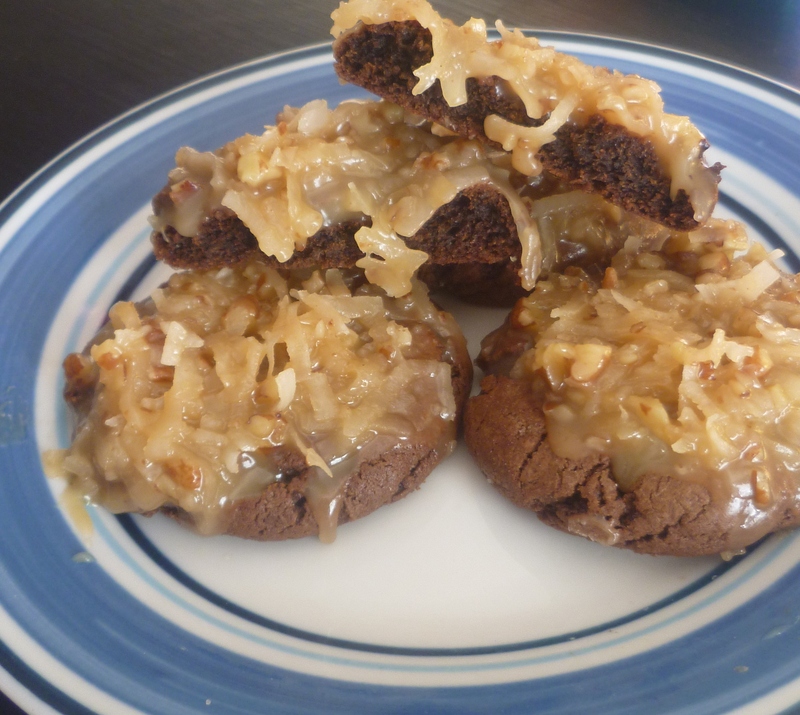 And now that I’ve depressed you all, I’m lightening the mood with some German chocolate cookies!! Stay tuned, because I’ve got lot’s of great pumpkin recipes coming up too this week. In a large mixing bowl beat the butter and sugars with a mixer until fluffy. Add the egg and vanilla and stir just until combined. Scrape the bowl as necessary. Add the melted chocolate and stir until incorporated, scraping the bowl if necessary. In a separate bowl, combine flour, cocoa, baking soda, and salt. Gradually add the flour mixture to the liquid mixture, stirring until combined. Drop the batter by tablespoonfuls onto the cookie sheet. Bake at 350 degrees for 10-12 minutes or until cookies are set in the center. Let cool on the cookie sheet for several minutes and then remove to a wire rack to continue cooling completely. In a large saucepan stir together the evaporated milk, sugar, egg yolks, margarine and vanilla. Cook over low heat, stirring constantly until thick. (This may take 10-20 minutes). Remove the pan from heat and stir in the corn starch, pecans and coconut. Allow frosting to cool slightly before frosting cookies.